People with echolalia repeat noises and phrases that they hear. They may not be able to communicate effectively because they struggle to express their own thoughts. For example, someone with echolalia might only be able to repeat a question rather than answer it. In many cases, echolalia is an attempt to communicate, learn language, or practice language. Echolalia is different from Tourette syndrome, where a speaker may suddenly yell or say random things as part of their tic. In this case, the speaker has no control over what they say or when they say it. Repetitive speech is an extremely common part of language development and is commonly seen in young toddlers who are learning to communicate. By the age of 2, most children will start mixing in their own utterances along with repetitions of what they hear. By age 3, most children’s echolalia will be minimal at most. It’s common for children with autism or developmental delays to have echolalia further into childhood, especially if they’re experiencing delayed speech development. 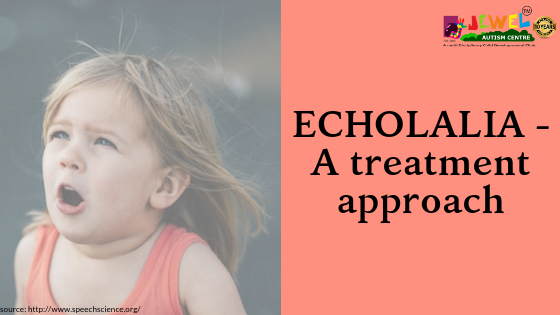 Identifying why and how your child is using echolalia will help you develop a treatment plan for it. Consulting a language pathologist can help. A behavioral intervention called “cues-pause-point” is often used for intermediate echolalia. In this treatment, the speech therapist asks the person with echolalia to answer a question correctly and tells them they’ll point to them when it’s time to answer. Then, the therapist asks a question, such as “What’s your name?” After a short pause, they prompt the speaker to answer. They also hold up a cue card with the correct answer.